Vietnam treasures and wants to develop comprehensive strategic cooperative partnership with China, stated Prime Minister Nguyen Xuan Phuc when receiving Chinese Vice Premier of the State Council Hu Chunhua in Ha Noi on September 11. The Chinese official is leading a delegation to the ongoing World Economic Forum on ASEAN (WEF ASEAN) 2018, which started the same day. At the reception, PM Phuc said the attendance reflects China’s support to Vietnam’s hosting of the event and congratulated China on its successful organisation of the first session of its 13th National People's Congress and People's Political Consultative Conference. 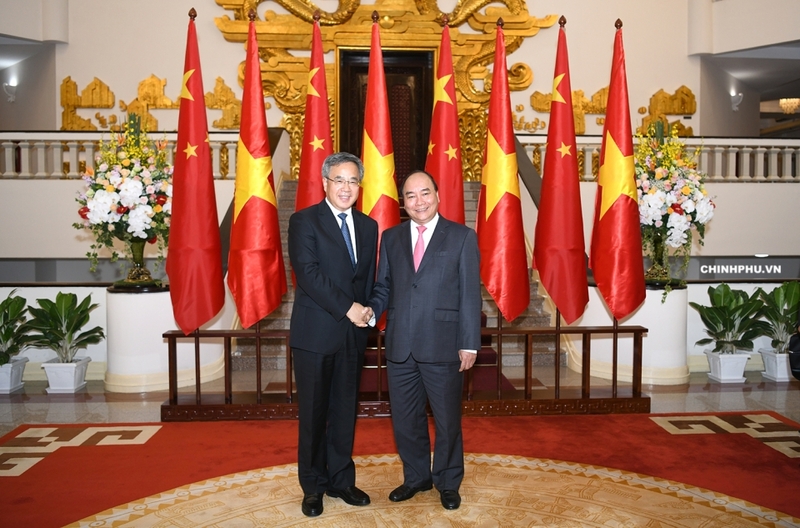 Prime Minister Nguyen Xuan Phuc and Chinese Vice Premier of the State Council Hu Chunhua. Phuc also spoke highly of the outcomes of the sound collaboration of the two countries last year, particularly in economy, trade, and investment. He suggested the sides continue to exchange and take measures in boosting balanced and sustainable development of bilateral trade, with Vietnam reducing its trade deficit with China. The Government leader asked China to facilitate Vietnamese goods, particularly farm produce, invest in high-tech projects in Vietnam, and carry out joint projects in line with bilateral agreements with progress and quality ensured. The sides need to accelerate cooperation in transport, agriculture, environment, science-technology, finance, and currency, Phuc said, adding that the effective usage of Chinese aid packages for Vietnam is also necessary. Measures to cut production costs should be studied in a bid to increase rail transport of goods from Vietnam to Eurasian countries via China, he noted. The PM also requested China create favourable conditions for Vietnamese airlines to operate and launch new air routes. Regarding issues on the sea, Phuc stressed the sides need to continue their serious implementation of their leaders’ common perception, and of the Vietnam – China agreement on basic principles guiding the settlement of sea-related issues. He highlighted bilateral respect of each country’s legitimate and legal interests in line with international law and the 1982 United Nations Convention on the Law of the Sea (1982 UNCLOS). The Government leader recommended the sides push for the improvement of mechanisms of maritime negotiations, effective and full implementation of the Declaration on the Conduct of Parties in the East Sea (DOC), and collaboration with the ASEAN member states to build the code of conduct in the East Sea (COC). For his part, Hu Chunhua affirmed the Chinese Party, Government and people are ready to work with Vietnam in enhancing their neighbourly friendship and comprehensive cooperation. He expected the sides to seize opportunities for win – win engagements across different spheres. The Vice Premier underscored China’s goodwill in increasing its imports of Vietnamese products, particularly farm produce, on demand to balance bilateral trade, and in the management and tackling of disputes to sustain peace and stability in the East Sea. Healthy and stable development of Vietnam – China comprehensive strategic cooperative partnership is also needed, he stated. The Chinese official wished Vietnam a successful hosting of the WEF ASEAN 2018.